We will use the existing Wireframes from assignment 09 and overlay on our existing assignment 10. We will change some attributes, add dimensions and style notes. Use the existing assignment 09 and overlay on assignment 10 layout as a basis for assignment 11 redlines. We will change some attributes, add dimensions and style notes. Establish colors and styles for Text. All styles noted; h1, h2, body, colors, etc. The Lines, Dimensions and Notes should be in their own (properly named) Groups respectively, all on a properly named layer. 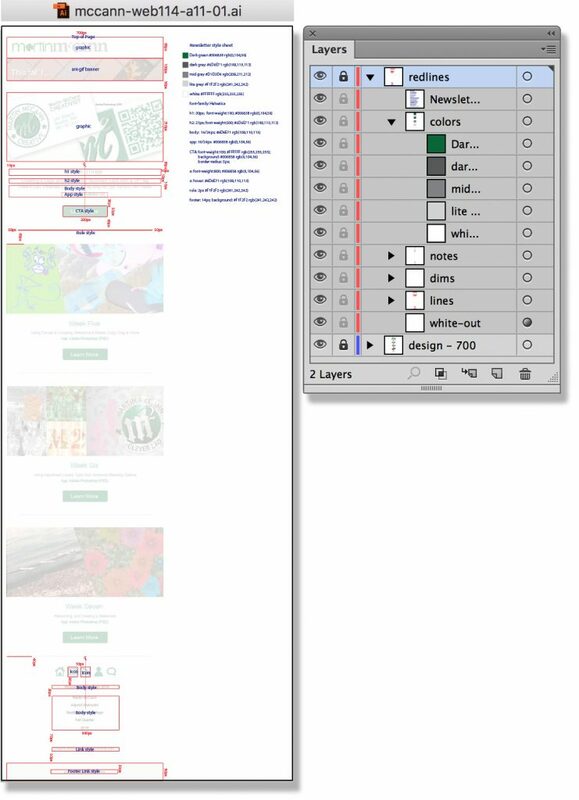 A white-filled Rectangle, placed on the redlines layer, should be used to “white out” the Design layer. Do not adjust the transparency of the Design layer. Lines are to have a red stroke and be based on rectangles from the wireframe or an actual line. No other shapes are to be used. A center line indicator is required to denote a center-aligned design. Color swatches (20px square) are to be included in style list with RGB and #HEX color mix. Dimensions are to be filled red and be consistent in size (at least 14px). If denoting horizontal spacing, the text should run horizontally. If denoting vertical spacing, the text should run vertically (rotate 90˚). Notes are to be filled blue and be consistent in size (at least 14px). Font weight style is to be noted if the design style is other then the default style. An anchor (a:) normal and hover style is to be included. Before final submission you will need to make sure all files are named properly and are being placed in a properly labeled assignment folder. Place properly named assignment file(s) in this folder.